If you’re an animal lover and have dreamed about winning the lottery, one of the ways you’ve probably imagined spending that windfall is by donating some of it to an animal shelter or rescue (or even building your own). Bryce Vucekovich of Dallas did just that. 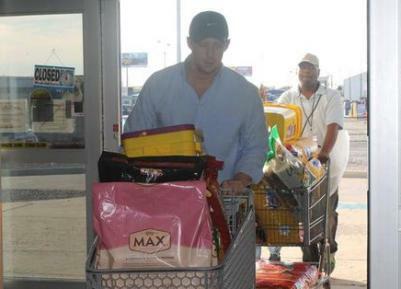 While the $500 he won from a scratch-off lottery ticket wasn’t quite enough to build a shelter, the 27-year-old spent it all on food and other supplies for Dallas Animal Services. “I always kind of told myself, I want to give to them if I ever come across extra money,” Vucekovich told CBS DFW. Vucekovich is dog dad to a three-legged mixed breed named Fred, whom he adopted from the same shelter on Christmas last year. He also has a one-eyed dog. Here’s hoping the next lottery that good (make that great) Samaritan Vucekovich wins is the Powerball jackpot (currently estimated at $80 million).